Although I am officially on hiatus my mind keeps thinking and planning ahead. I wonder how long it will be before I finally surrender to this "hiatus" and pick up one of my unfinished scripts to complete it? 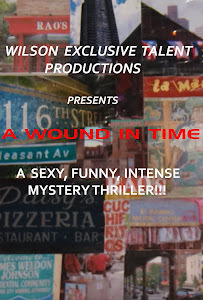 But I have decided that once I return from Europe I shall go into pre production of the feature film "A Wound In Time". Pre production takes lots of planning so I will have time to showcase "The Grinder" and mount "Blood Makes The Red River Flow" Off Broadway for a limited run. At least that's what my mind is telling me. In January I will officially end my hiatus and we shall see what we have... Stay tuned. KINDA ON SELF IMPOSED HIATUS... TRYING TO BE!